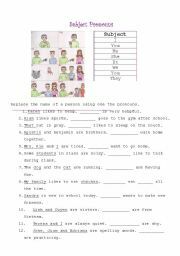 Students can practice subject/personal pronouns in this worksheet by using the pictures to familiarize with each pronoun. 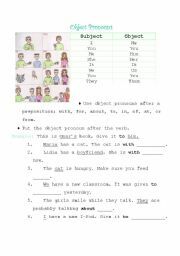 With this worksheet the students learn object pronouns and they can use them in sentences. 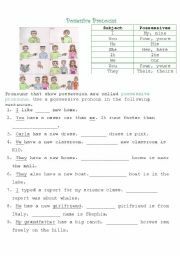 Students practice possessive pronouns with this worksheet. 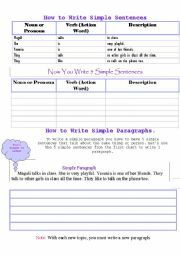 I use this worksheet with my students at the begining of the year to teach them personal pronouns. 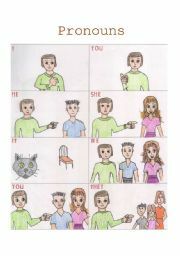 This is the first of four worksheets on pronouns. Students learn and practice possessive pronouns with this exercises. 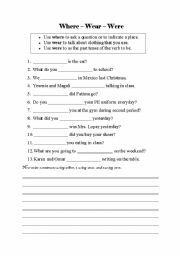 This worksheet has a total of 7 exercises: reading a dialogue with a partner, matching, reading comprehension questions, writing a letter, fill in the blank, puting words in order, writng questions, and one exercise with the alphabet. I hope you find it helpful. This worksheet teaches the students how to write a simple sentence and how a group of sentences can be put into a paragraph. This worksheet teaches the numbers and how to read them. It also has exercises to practice writing numbers. 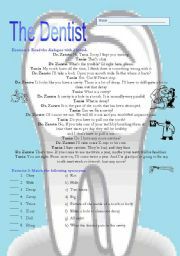 This worksheet helps the students practice using the words where, wear and were. 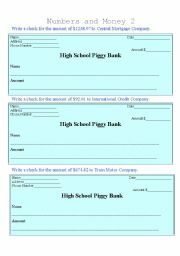 This worksheet allows students to practice writing numbers and checks.